Back in my college days, I happened upon a perfume called BCBGirls “Star” by Max Azria. It was one of 4 scents in the BCBGirls collection. I forget how I originally came across it, but I ended up owning it and loving it. It’s probably my most favorite scent ever. Unfortunately, it was discontinued years ago. The bottle I have now is one I’ve had for I don’t even know how many years. It may even be my original bottle still. I’ve had it for ages. I rarely ever use it because there’s only a fraction of an ounce left. When I noticed it getting low several years ago and went scouring for another bottle, I was much chagrined to find out it was discontinued. I feel like in my original attempts to procure another bottle, there was still hope of getting one at the time because it hadn’t been discontinued for so long and online vendors may still have had a residual supply. But I never pulled the trigger on buying another bottle. And thus at this point, searching for it only yields results from eBay that seem to be used and/or former tester bottles of questionable origin and a dramatically marked up price due to the rarity. Or the shower wash. Being as I still have a small quantity left, I wondered if there were some type of service in existence that could maybe duplicate a scent somehow if you sent them a sample. My internet inquiries led me to Scentmatchers.com. It’s a site that claims to be able to replicate discontinued perfumes and colognes. No sample needed. You can either choose from a long list of scents that they have already successfully replicated in the past, or you can opt to try to describe a scent to them and they will go from there. The latter sounds like it would be super risky and probably highly unsuccessful in a lot of cases, so luckily I found BCBGirls Star on the list. Of course, I delved into some reviews. They were mixed. Are reviews for anything ever not mixed, though? Different things work and don’t work for different people. I treat all internet reviews with a grain of salt, really. I’m reading the opinions of strangers whose tastes and proclivities I don’t know. Like with Sammydress…it worked for some people, it didn’t for others. C’est la vie. I only search for reviews of online businesses I haven’t bought anything from before really to make sure it’s not a blatant scam of some sort. So, for $50.00 they replicate your chosen (or described) scent and allow you a selection of bottle options to choose from. And you can choose a name/phrase to be printed on the bottle. I figured it was worth a gamble if it somehow reunited me with something close to one of my favorite perfumes. If not, then I wasted $50.00. Wouldn’t be the first money I’ve wasted, wouldn’t be the last. The risk was worth the reward, so I tried my luck. I wasn’t sure what name to choose to print on the bottle. I didn’t want to use the original because it’s certainly not the original. 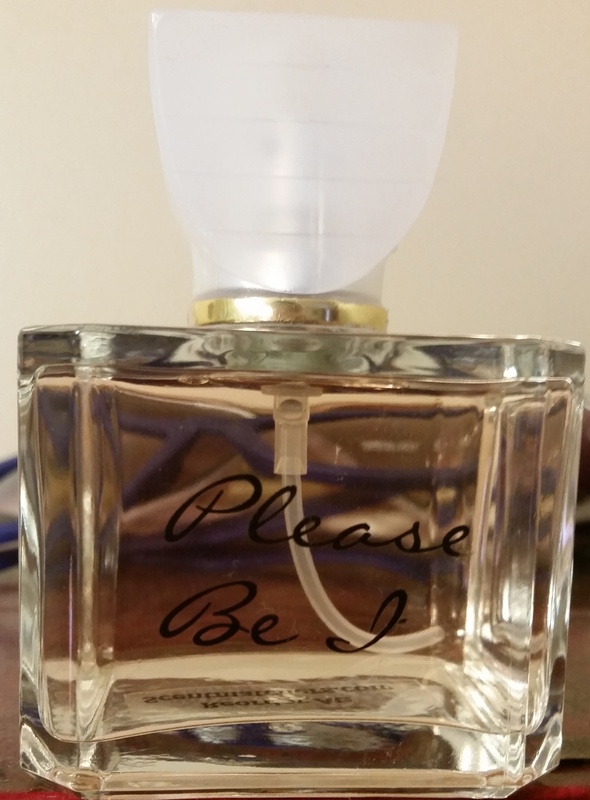 I decided on “Please Be It” since I wasn’t feeling particularly imaginative and really didn’t care about the name on the bottle. I just really wanted my Star. Well, it’s almost it, at least. I ordered it last week. The package arrived Monday, but I forgot about it until yesterday morning when I was readying for work. Upon unpacking it, I noticed that there were a few condensation droplets on the bottle and on some of the surrounding paperwork in the box, as if it had leaked or sprayed or something somehow. But it was nothing massive and the bottle was perfectly full once I removed it from the satin sack it was enclosed in. However, even though they printed “Please Be It” on the bottle as I requested, the “t” was smudged and it wiped completely off when I rubbed it. Eh. Pretty impressive. While I can tell a mild difference between the original and the replication (the original smells a bit more intense), it is a very, very, very, super close approximation. Enough for me to be satisfied. I’m sure the success of Scentmatchers is going to vary from scent to scent, naturally. I’m sure there are some that they can do better than others and everyone is not going to end up happy. But as far as BCBirls Star goes, I consider it $50.00 well spent.